Soundbar installation service may sound like a “fancy add-on service” that isn’t necessary to your home TV setup, but did you know that as technology continues to advance, soundbar installation service becomes an increasingly important staple in a healthy home entertainment system. Have you noticed lately that the sound quality of televisions has begun to decline? If so, you’re not alone. Many electronics consumers have begun to notice a significant decline in the sound quality of their new television models. What is causing this problem? Ironically, it’s our desire for new technology. You will notice that each new TV model that comes out is thinner than the last. This thin screen creates a lightweight television that is aesthetically pleasing and appealing to you as a consumer. This beautiful thin screen poses a problem, however. As television screens get thinner with each new release, the space inside that television for speaker and audio components declines. Remember those giant 400lb. televisions that were so very popular years ago? Sure, they were clunky, heavy, huge, and otherwise inconvenient, but the space inside the television unit itself provided plenty of room for large speaker systems that could amplify and project sound. Now that televisions are becoming as thin as a few pieces of cardboard, we do benefit from how light and convenient these screens are, but we also tend to forget that inside these televisions there simply isn’t any room for large speakers or audio components. What this means is that while your new super-slim television might look fabulous, it probably sounds pretty terrible. If you too have noticed that the sound quality on your television is lacking, we advise considering a soundbar installation service or a surround sound speaker system installation. Few people want to go back to the days of poor quality picture projection even if it does come with much better sound quality, so the answer lies in supplementing the sound that is coming from your television’s speakers. There are two ways to do this and which way is right for you depends on a few factors. A soundbar installation service can amplify your television sound without the inconvenience of free-standing speakers scattered throughout the living room and without having to install wall or ceiling hung speakers. This is the perfect solution if you are renting your home or if you simply want to add a little boost to your TV sound without going overboard. A soundbar installation service is also a more economical way to boost your TV’s audio without breaking the bank. There are many types of soundbar’s on the market today and it’s not hard to find one that will fit your budget. It is important, however, to do your research before purchasing your soundbar and calling in your soundbar installation service. Go to the electronics store and spend time listening to the quality of sound that each soundbar offers, consider the size of your room, and the type of sounds that you listen to most (for example bass-heavy sound) to make sure to pick out the best soundbar for your needs. If you are looking for a much larger sound profile and you don’t mind having freestanding speakers in your living room or you are able to wall or ceiling mount surround sound speakers around the room, surround sound installation is a good option too. Surround sound creates a larger sound profile and immerses you in the sound of a movie so much so that you often feel like you’re a part of the movie yourself. Of course, surround sound systems aren’t cheap…at least if you want a quality sound system that doesn’t sound “tinny” they’re not, so this isn’t the best solution if you are working with a smaller budget. 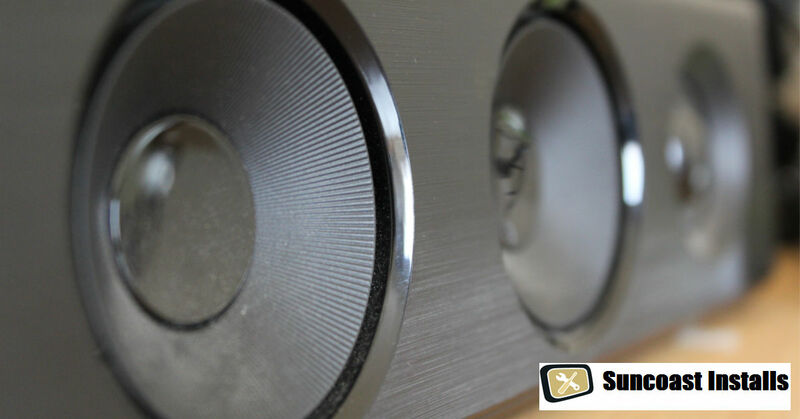 As with a soundbar, you need to really experience the sound that a surround sound system has to offer before investing in a surround sound system. Go to your local electronics store and spend some time listening to the sound profile of each surround sound system and talk with the salespeople to find out as much as possible about each surround sound system that you are considering. Need a Professional for your Surround Sound or Soundbar Installation Service? If you live in West Florida and are in need of a professional company for your surround sound or soundbar installation service, Suncoast Installs can help! Give us a call today at 727-480-8358 to make an appointment with one of our installation specialists and to get the job started ASAP!